With the new SMRT Circle Line, it is so much easier to go to places like Telok Blangah, Pasir Panjang and Labrador Park; it has made lots of eating places more accessible. I can go on and on about all the food places, but I think it’s a better idea to read my guide to restaurants near SMRT Circle Line. As part of the campaign by SMRT to let more people know about the eating places near to the new Circle Line, I hosted two food outings at one-north and Botanic Gardens MRT Stations where twenty readers joined me and dined for free. For those of you who are not familiar with the two areas, I’m sure you would want to find out where to go for yummy food. Two weeks ago, we had the food outing at one-north MRT Station and we went to Shin Nichi (1 Fusionopolis Way, #02-20/21 Fusionoplis Tel: +65 6466 3511) for Japanese food. Many people probably have not been to Fusionopolis since it is situated in a business park, but there are a few dining options there – like Penang Place Restaurant, Koryo Korean Restaurant and Eighteen Chefs – that are worth a try too. I had a wonderful time, and it was lovely to meet people who love food. I’m thinking about doing more food outings for this year, we’ll see how that goes! 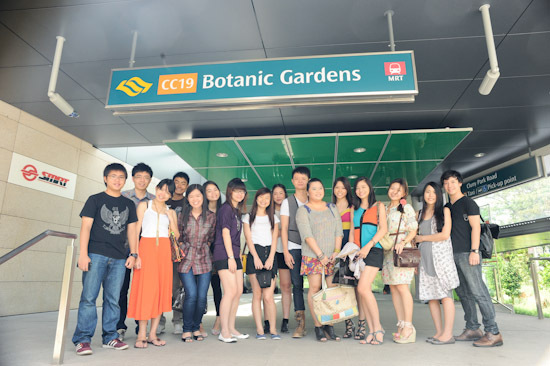 Another SMRT food outing was held at Botanic Gardens MRT Station, which is located along Bukit Timah Road. I always go to the area, as there are lots of good food places. With the new Circle Line MRT Station at Botanic Gardens, you can easily get there and eat the famous Selera Rasa Nasi Lemak at Adam Road Food Centre, or go to Cluny Court to have burgers at Relish Restaurant and Serene Centre for ice cream at Island Creamery. Further down the road is Coronation Plaza, where there are eating-places like Burger Shack, Choupinette, En Japanese Dining Bar, and Swiss Grill – the place we went for the SMRT food outing. I hosted the food outing at Swiss Grill (587 Bukit Timah Road, #01-05 Coronation Shopping Plaza Tel: +65 6463 8080) because I wanted to introduce a restauarant, which serves good food at affordable prices. Most of the items on their menu – burgers, sausages, and salad – are priced reasonably below $15; and you can get a 200g Angus Ribeye for $39.90. Everyone agreed that Swiss Grill has really good burgers, so do check it out when you are in the area. I’m sure you know this by now, but in case you’ve missed out on the news: Bayfront and Marina Bay Stations are finally opened on 14th Jan 2012. I love going to the Shoppes at Marina Bay Sands to walk around, so this is great news for me as it will be easier to go to MBS via the new Circle Line MRT Station. To get to Bayfront MRT Station, you can transfer at either Marina Bay or Promenade MRT Stations. That’s it folks. I had fun at the food outing, and I hope to do another one soon. Meanwhile, Qiuting will be organising the last SMRT food outing in February, you can join her by registering at the SMRT Circle Line page. woow, this is so interesting FOOD OUTING . can you do a valentine’s day where to eat post? thanks!